What an honor to have Jill Rowley with us, the queen of social selling herself. 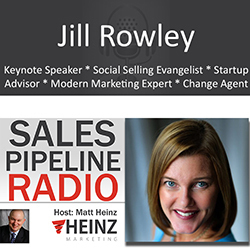 During this episode Jill shared her thoughts on social selling and the fact that it can be a differentiator, but it is sitll an incremental channel. Traditional channels are not dead: phone, email. Social selling is a refined and updated way of selling. #knowthybuyer - you need to understand the world in which your buyer lives: demographics, industry. She saw the changing buyer, how they were transforming by doing research on the web. leveraging content to self-educate. Buyers are allergic to being sold. She tells us, "My job is to help you, not sell to you. My job is to BUILD relationships of credibility and trust. The modern seller has to be one that is willing to help." Leveraging other people's content from the industry. Great way to build relationships and share posts of value. Best of the best curated content. Learn from her example - sharing other people's content broadens your views, knowledge and shows your value to your readers and those who produce the content you share. Call, email, call, email. And they respond with: Ignore, delete, ignore, delete. Give them something VERY specific to that individual, company or industry that gives an insight - something of VALUE to them - then they respond. Social is the channel to do research to be relevant, to build relationships. You'll have to listen to the show to get the rest of her insights and tips.